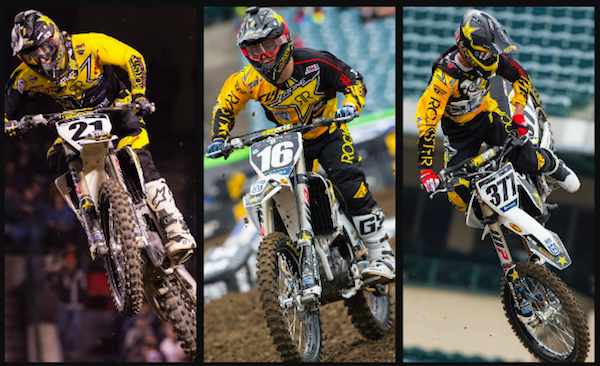 Zach Osborne is very clearly riding on a completely different level this year. He is a threat for the win every time the gate drops, whether it's a heat or the main event. This weekend Osborne was able to lock up the fastest qualifying position of the day in the final 250 A practice as well, which is a feat in itself. His starts have been good all year too, which is obviously a huge part of success. Zach started around the top 5 in the main and quickly moved into 3rd where he watched a cat and mouse game unfold in front of him. As two of his rivals went back and forth, ZO closed quickly, ready to capitalize on a possible mistake by the duo, thrusting him into the lead. That never happened, but when the skirmish cleared, he was able to collect another spot, to find his way back onto the podium with a 2nd place finish. Zach Osborne - "Today was a pretty good. I ended up on the podium with a 2nd and had pole position in qualifying practice. I rode a little tight tonight and Im not quite as pumped about my 2nd as everyone else is, but it's a solid result. I threw a 2nd away last weekend with a lap and a half to go and I didn't want to do the same thing again. It was a solid consistent ride. I knew things were going to tighten with [Cooper] Webb and [Christian] Craig battling. I made up 3 or 4 seconds on them in just a couple corners. I didn't attack quick enough to get by them, but it is what it is. We will come out swinging in Oakland." Jason Anderson was solid again throughout the day during qualifying. After the smoke from the fireworks blew out of the stadium, he unfortunately missed qualifying out of his heat for the first time this year. Finishing in the top 4 out of a heat is very tough. However; in his semi, he got out front and won easily. In the main, unlike his teammate, he did not get a good start. In fact he was well outside of the top 10. Anderson put in another great comeback to get all the way up to 5th, but that was all the 21 could muster. If Jason can find a way to consistently start in the top 5, he could possibly finish on the podium every round. Jason Anderson - "Tonight was not the greatest, but also not the worst. I got 5th which is nothing to be bummed on. Just gonna come into next weekend and try and get back on the podium." Christophe Pourcel is continuing to learn and improve consistently each weekend. Anaheim 2 was no different as there was a notable change in his attack. The first couple rounds he was just trying to find himself after the long layoff, now he is beginning to move forward. Unfortunately a rider turned left in the right hand first turn immediately in front of him in the main, so he rounded the second turn just inside the top 20. The difference this weekend was his ability to move forward through the pack. He was able to near the top 10 by race's end and will find is way inside that pack of riders very soon. Christophe Pourcel - "Today was good during the afternoon again with my speed and I feel comfortable. It feels good to go fast, I just need to bring that to the night show. Tonight I almost qualified out of my heat, I was just having a little trouble with the big set of whoops. During the day I was super fast through them then they changed the first few and it was a little sketchy. I was losing too much speed there. I ended up 12th, just a little progress from last week. I felt like I was a bit more aggressive tonight, I'm not quite where I want to be yet but it's only 3 races in. After a couple more races I want to be able to charge more, do my 20 laps and move up to the group that's finishing right in front of me now and keep improving."